I was updating the title bar for my blog yesterday, as you will see above with images from our collections as opposed to the books which came as standard (which I’ve been meaning to do for the last few months). On logging on to wordpress I saw this featured blog. 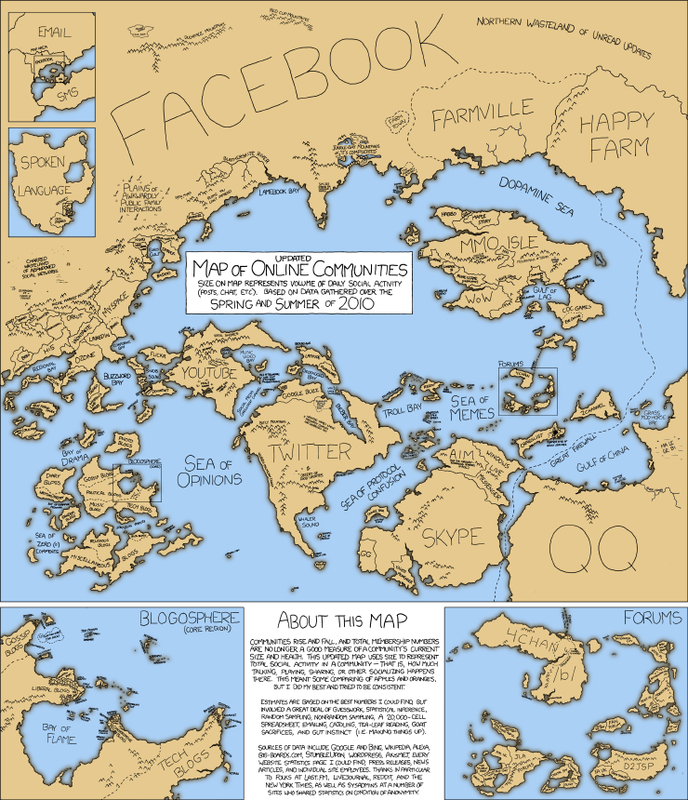 The geeky but very popular webcomic xkcd produced a new map of online social communites. It’s an interesting if not entirely scientific representation of based on how popular communities are based on social interaction as opposed to total membership. Another similar version of the above was also carried out by marketing firm Flotown, both show what has become the pre-eminence of facebook. What is really interesting is if you compare it to the 2007 version below. Look at how small facebook is compared to Myspace, similarly twitter is notable by its non-existence, something that is hard to believe these days. One of the other interesting things you notice about the 2010 version is the enlargement of size of things like farmville, social gaming is increasingly popular (as anyone who has a facebook account and is constantly spammed by request to join friends in games will know!). One of my own favourite things is ‘the plain of awkward social family interaction’ as older users have flocked to facebook in recent years, it appears that the younger audience has dropped off. Maybe having your mother comment on your pictures proves too much for some! Talking about facebook, it also has provided a platform for a new page for Edward Hussey III of Scotney Castle. The page will be updated a couple of times a week with information from Edwards diaries etc from Maidstone Archives between now and Christmas. It will add snippets of information about the construction of the new house at Scotney and also contain links to images in the collection. So if you want to know Edwards 13 objections to the old house at Scotney, please check out his page!